Our top-class formula produces a pigment that is rich and creamy, allowing you to use less of the product in each application while obtaining better results. The high viscosity also promotes accurate, long-lasting color retention - which translates into satisfied clients. Our ¼oz. Absolute Perfection 21-Color Kit includes every color you will need to carry out your procedures - from eyeliner to corrective pigment camouflage. It's the perfect starter or sampler pack to get you switched over to the best pigments on the market. 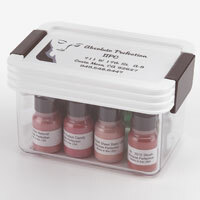 And all of the pigments mix together effortlessly, should you choose to custom blend. The kit now includes a rewetting solution and a Magic sample. Glass cup used during procedures to cleanse pigment colors out of needles. Essential for true color application. 1oz. cup. 3 inch multi-purpose cotton swabs. Each unit contains 10 pouches of 100 swabs for a total of 1,000.